After making the Halloween pull up treats for my daughter to hand out at dance class, I decided to use some of my leftover fat quarters to make a bag to hold them that she could then give to her teacher. I found this cute friendship bag tutorial but wanted to make the bag bigger. So I used the tutorial and below the pictures I've listed the changes in size that I made. It held 11 pull up treats perfectly. this one shows the inside and my designer (haha!) label. I cut the strips-six for each side-2.5" x 6.75", the bottom 6.5" x 12.5", the lining 12.5" x 19" and the handles 2.5" x 17" (instead of following the tutorial I sewed the handles into tubes and turned them right side out). When I boxed the corners, I sewed just under 2" from each point. If I made it again I would do something to stabilize the handles better. They were pretty floppy. But she loved it anyway! gale this is so awesome-- i so wish i could sew!! i love this-- do you have an etsy shop???? that is so stinkin' adorable. and you made it!!! love the colors. 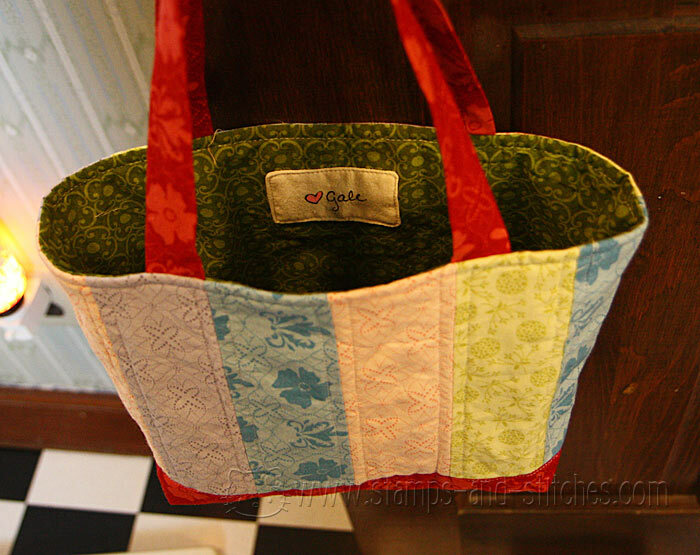 Gale, this is a perfect tote bag!! You need to mass produce these and sell them - you even already have that designer label! Fantastic. That is adorable! What a fabulous gift!! Ohhh my this is a great little tote. 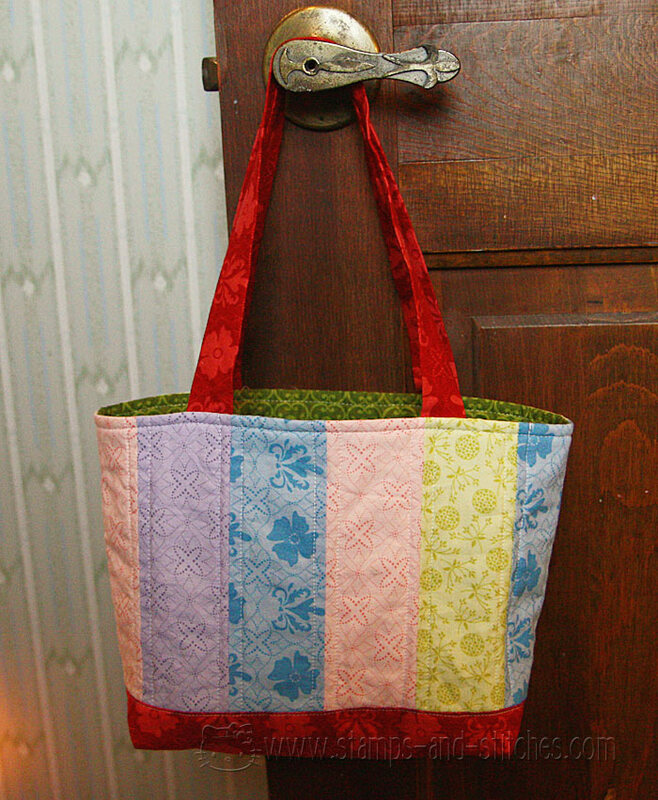 I have so many tote bag patterns and such, but haven't yet made them. this is too cute! and what a great use for smaller fabric scraps! Gale this is so cute and I LOVE your label! I agree with Mary Pat, wish I could sew too. You're so lucky. This bag is so adorable! It's another one to my TO DO LIST. Great bag! I got a sewing machine for my birthday last year. I need to start trying to make stuff! Great idea. Your daughter would have loved carrying her goodies to dance class in this. It's a great little tote! Your tote looks great. I will make one using your larger size sometime..thanks for sharing and reminding me of this great tutorial! Gayle, This is awesome! Fun colors too. That is just adorable, Gale! I love the color combo and even your label :) The teacher must've love it! Love the bag, it is just adorable! You make me want to sew again. What a darling bag. I love your private label.